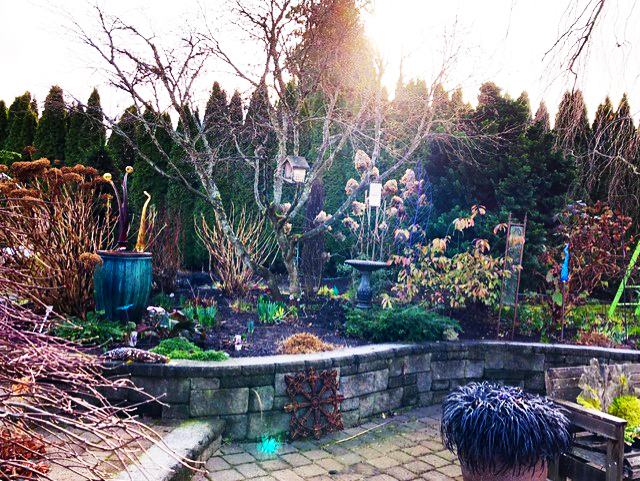 Steve Smith’s garden in winter. Photo courtesy of Sunnyside Nursery. We could all use a little less “screen time” and a lot more “green time” - in my humble opinion. Okay, I confess that one of the first things I do in the morning is to turn on my phone/computer and check my news feeds - mostly to see what might have happened over the last eight hours I was sleeping. It’s pretty ridiculous when you think about it, but that seems to be the norm. It has been estimated that adults spend 11 hours a day looking at screens and check their phones every 10 minutes. According to the American Academy of Pediatrics, tweens log in 4.5 hours a day and teens spend almost seven hours. Imagine how much happier and healthier we all might be if we spent that much time in the garden. This last week was a glorious opportunity to work in our gardens and that is exactly what I did. It was so nice on Saturday the 12th that I was actually working in a t-shirt. It is hard to imagine that in the month of January a person could be comfortable in only a t-shirt, but I am living proof that it can be done (and I am not one of those whacky people that insist on wearing shorts 12 months a year). Not only did I accomplish a ton of chores, but I also felt fantastic when it was all done. There is nothing quite as gratifying as looking back over your hard work and thinking, “I did that, all by myself, and it looks pretty darn good.” And you know what else? I never once thought about the news and all the craziness that is going on. It’s exciting to see what is sprouting up and coming back for another season. You can look down at the crown of a Sedum “Autumn Joy” perennial and where there were six to eight shoots this time last year, there are now two to three times that many. Immediately my mind envisions what that is going to look like later in the summer and it is exhilarating. I can almost feel the endorphins moving from one neuron to the next. The Snow Drops are also showing color, their nodding white blooms are a reminder that the rest of the bulbs are not far behind. My first Winter Aconite, as diminutive as it is, is a cheery surprise in the shade bed on the north side of the house. It’s really a shame that more people don’t make the effort of introducing a greater variety of plants into their yards. It’s such a simple thing to do and the rewards are endless, especially this time of year when everything seems so dark and lifeless. Sunnyside will be hosting a free class - PNW Fruit Trees - Saturday, January 26th, 2019, at 10:00 am and 2:00 pm; and again Sunday, January 27th, at 11:00 am.